Sowerby Bridge produced a strong second half display to beat Ovenden West Riding 3-1 in an all-Calderdale final to the West Riding County FA Trophy. They picked themselves up well from their Challenge Cup final defeat at the hands of Greetland three days earlier, a Damian Watkins hat-trick giving them success. Both sides made a cautious start at the county FA’s headquarters at Woodlesford, Leeds, but Bridge went ahead after only six minutes when Sam Hiley found Watkins, who kept his cool before firing home. Watkins had scored after five minutes at the Shay before fading out of the picture but this time the prolific scorer was to continue to have an impact. Ovenden responded well with Hayden Kerris and Glyn Beale giving the front runners plenty of service. It was all square 10 minutes after the Bridge goal when a through ball found Damian Randall, who rifled home. John Booth then sent a shot inches wide before a Luke Maguire 20-yarder hit the bar at the other end. The midfield battle was going to be the key to the game and the outstanding Tom Hiley was doing a great job to aid Bridge’s cause. Much of Bridge’s offensive action was coming from some fine deliveries from full back Ben Hiley but the Ovenden rear guard, with Scott Eastwood organising well, kept them at Bay. John Booth got clear minutes before half time to go one on one with Jordan Bolton but the keeper made a great stop. 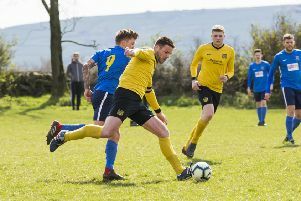 West Riding County Amateur League Division One champions Ovenden finished the half strongly but were unable to find a second goal. The Bridge made a strong start to the second half with the outstanding Luke Maguire and Tom Hiley starting to get on top of the midfield. Maguire shot inches wide after some good build-up play whilst at the other end Booth beat the offside trap but shot straight at Bolton. Maguire supplied a deep cross that saw a Watkins effort well saved by Ovenden keeper Lewis Scott and again Booth got free but was halted by good defending from Ben Hiley. Bridge were gaining control now with Maguire a key man. He linked up with Martin Bates before finding Watkins, who fired home for the second goal. Ovenden were pushing men forward but could not penetrate an excellent Bridge defence in which Ryan Brook and Kai Hadley were outstanding throughout. Victory was sealed when substitute Jordan Bedford and Lee Wood created the opening for Watkins to complete a memorable night for the Halifax AFL Premier Division side. Ovenden WR; Lewis Scott, Jamie Randall, Jordan Wadsworth, Terry Ryan, Andrew Butterworth, Hayden Kerris, Matthew Jones, Scott Eastwood, Glyn Beale, Damian Randall, John Booth. Subs; Andrew Bailey, Liam Carroll, Graham Sides, Ash Scully (not used), Steve Fullard (not used). Sowerby Bridge; Jordan Bolton, Ben Hiley, Kai Hadley, Ryan Brook, Joel Cleary, Sam Hiley, Luke Maguire, Tom Hiley, Andrew Markham, Lee Wood, Damien Watkins. Subs; Adam Barlow, Jordan Bedford, Martyn Bates, Chris Stanton (not used), Jamie Jepson (not used).